I love a good sponge cake. I especially love a sponge cake that is dressed up a bit. This cake is called a pie but it is not a pie. It is a lovely, tender crumbed Victoria Sponge with a rich chocolate ganache topping and a beautiful silky smooth creme patisserie filling. Until I got my Cuisine Companion, I had always avoided making creme patisserie. I hated all that standing and stirring at the stove. I also hated it when it would catch on the bottom of the saucepan. Fear not, the Cuisine Companion makes creme patisserie child's play. Pop all the ingredients in the jug and five minutes later you have a beautiful thick and smooth creme patisserie. Also easily made in the Cuisine Companion is the lovely rich chocolate ganache. So simple. 225g unsalted butter. Cubed and very soft. 1. Grease and line 2 x 21cm sandwich tins and preheat the oven to 160 degrees. 2. Place all ingredients except the milk into the CC jug with the kneading blade. 4. When finished, scrape down the sides of the jug and then select speed 6 for 20 seconds and with the motor running pour in the milk. 5. Divide the mixture evenly between the two tins and bake for 25 minutes (check after 20 mins if your oven runs a bit hot). 6. Remove from the oven and allow to cool in the tins for five minutes before turning out onto a cake rack to cool completely. 1. Place all ingredients in the CC jug with the whisk attachment. 2. Select Speed 4 Temperature 90 degrees for 5 minutes. 3. When finished select Speed 6 Temperature 0 for 10 seconds. 4. Place creme patisserie in a wide mouthed bowl and gently cover the surface with glad wrap to prevent a skin forming. Cool at room temperature. Do not put it in the fridge as it may become graining. Assemble cake by spreading the creme patisserie over one cake. 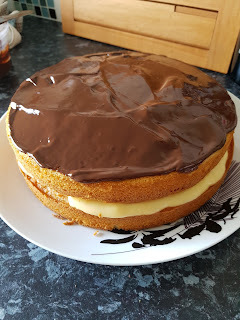 Place the other cake on top and then spread the ganache evenly over the top. Enjoy!